The OMB-DAQSCAN-2000 Series of Ethernet-based data acquisition system components provides analog, digital and frequency I/O capability for Ethernet-based test systems. All OMB-DAQSCAN-2000 models are packaged in a 1U high-full rack package and include a rack-mount kit that can attach to either the front or the rear of the enclosure. Multiple OMB-DAQSCAN models can be combined in the same system and synchronized using a simple SYNC connection between units. All I/O i s accessed via female DB37 connectors located at the rear of the unit, making cabling easy from the OMB-DAQSCAN-2000 to your device-under-test. Four models in the OMB-DAQSCAN-2000 Series are available, ranging from the OMB-DAQSCAN-2002 which offers digital/frequency I/O, to the full-featured OMB-DAQSCAN-2001, which includes 16 analog inputs, 4 analog outputs, 40 digital I/O, 4 frequency inputs and 2 timer outputs. The OMB-DAQSCAN-2000 Series includes comprehensive drivers for all popular Windows-based environments, including Visual Basic, C/C++, ActiveX/COM, LabVIEW, MATLAB, and DASYLab. Also included with the OMB-DAQSCAN-2000 Series is DaqView, an interactive spreadsheet-style application that is ideal for verifying signal connections during system design. The compact 1U high 19” rack packaging of the OMB-DAQSCAN-2000 make it a compact component for rack-based systems. In addition to the built-in I/O provided by the OMB-DAQSCAN-2000 Series, a wide variety of signal conditioning and expansion options are available. Below are some sample systems that can be derived from the OMB-DAQSCAN-2000 along with OMB-DBK options. When combined with the OMB-DBK90 thermocouple input module, the OMB-DAQSCAN-2000 Series can measure up to 896 channels of T/C input. In the example system to the right, any T/C type can be installed into any channel using standard mini T/C connectors. Each 56-channel OMB-DBK90 option consumes 2U of rack space and can be mounted on the front or rear of the rack chassis. Built-in cold junction compensation coupled with T/C conversion algorithms built into the software make temperature measurements easy. Thermocouples are measured at 1 ms/channel in a system based on the OMB-DBK90. The OMB-DAQSCAN can be combined with the OMB-DBK207/CJC options to create an isolated system capable of measuring up to 256 channels of voltage, thermocouple, RTD and strain gage inputs. All input channels can be scanned up to 200 kHz and are isolated by 500 V from other channels and from system common. Any combination of input signals is possible by selecting the appropriate OM5 signal conditioning module for the OMB-DBK207/CJC. OMB-DBK207/CJCs can be mounted at the front or rear of the rack. They attach to the OMB-DAQSCAN via a simple OMB-CA-37-10 cable. When the OMB-DAQSCAN-2002 is combined with the OMB-DBK208 options, up to 256 channels of isolated digital I/O are possible, capable of controlling AC or DC voltages up to 250 V or sensing the presence of AC or DC voltages. All channels are isolated from one another and from the system by up to 500 V. Inputs can be scanned in 16-bit increments at speeds up to 200 Kreadings/s. The OMB-DBK208 can be mounted at the front or rear of the rack. The OMB-DAQSCAN-2005 can be combined with OMB-DBK85 16-channel voltage input modules to build a 5 µs/channel voltage measurement system with up to 256 channels. All inputs can have a different software programmable input range, from 156 mV FS to 10 V FS, programmable on a per-channel basis. 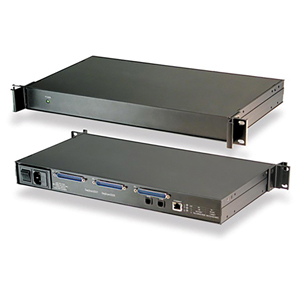 The 16 BNC inputs on the OMB-DBK85 can be accessed from either the front or the rear of a rack system. All of the foregoing capabilities can be combined into a single system using one OMB-DAQSCAN-2001 as the system centerpiece. Analog, digital and frequency inputs can be scanned synchronously, based on either an internal programmable timer or an external clock source. The four analog output channels are updated synchronously relative to scanned inputs, and clocked from either an internal onboard clock or an external clock source. Analog outputs can also be updated asynchronously, independent of any other scanning in the system. Counter inputs can be scanned synchronously along with analog and digital scanned inputs, based either on internal programmable timer or an external clock source. Counters can be configured to clear when read or to totalize and clear under program control. 참고: All OMB-DAQSCAN-2000 models include 10/100 BaseT Ethernet interface, Daqview Software, drivers for LabVIEW, DASYLab, C++, Visual Basic and ActiveX/COM; DB37 connectors, external SYNC, complete operator’s manual on CD ROM and rack-mount kit also included.